Our custom childs portion plates are made of food grab polypropylene and feature a single logo imprint. Let your brand promote a healthy lifestyle, not only among new and repeat customers, but also among their children, with the Children's Portion Plate. 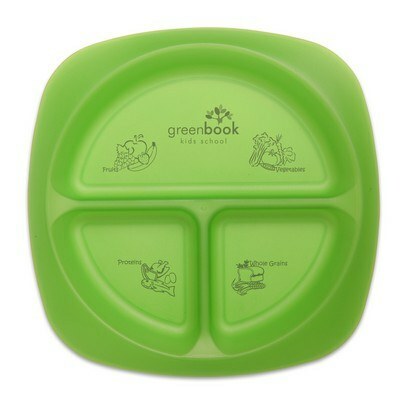 It is made of durable food grade polypropylene and has three compartments to help with portion control. The larger half is recommended for fruits and vegetables; the two smaller quarters for grains/starches and meats/proteins. The plate reinforces balanced eating and a healthy diet among children. Screen print your company’s logo on this essential item and improve your lifestyle. Give it away at trade fairs, wellness programs, nutritionist clinics, and learning centers, to boost your brand image among health conscious clientele.